The telvision comedy show has been on air since 1993 and is now enjoying it’s 20th season. The task here was to generate print and online advertizing that would tie into PR/Communications efforts to increase reach for thr show during the 19th season. With the use of supplied elements, which needed retouching and graphis adjustment, a series of ads was produced to co-inside with upcoming episodes. In every case the timeline was extremely short due to the tape/edit/broadcast nature of the show. Ads after the show would be useless since the idea is to give a sneak peak prior to airing to draw audience. 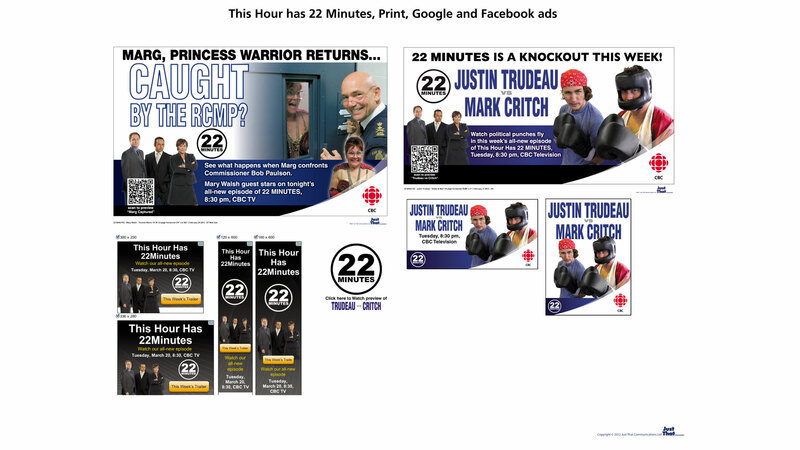 These ads were placed in national publications (Toronto Metro and the Globe & Mail) for national reach and audienceship.